To produce a feature film that ignites an honest conversation about race using the power of comedy. This film is not meant to mock or make fun of any race. The protagonist in White Like Me is frustrated with where she is in life and thinks that things will work out differently if she changes her appearance. Whether or not that's true or that happens is one of the reasons this film is so relevant. During our original campaign we set out to raise $250,000. Well, we're almost at our goal! Thank you to all those who supported us on Indiegogo, Venmo and Paypal. Since we're so close, it's time to shine a little brighter and see if we can make our goal! We have an exciting team so far! White Like Me welcomes Executive Producer Antonio Enciso! Now, when a studio wants to "diversify" their film, they cast a black man or other man of color. It is very rare to see a black female lead on the big screen, and more often than not she's a famous singer in real life. Which is fine. But why doesn't a white actress have to be a famous musician in order to get a lead role in a film? Next time you're scrolling through Netflix or driving past a movie billboard, think about this. "I've never done a movie, any movie, the silliest movie, where someone, some studio person, hasn't gone, 'Does the girl have to be black?'" -- Chris Rock, in Essence magazine. Hi! Thank you so much for coming to our campaign page. It's so great to have you here. Take a look around. Make yourself comfortable. I'm Brandee Steger! I'm an African-American actress ("20s, urban, sassy"--kidding! ), a writer (having started off as a journalist) and a producer (with a couple of awards for a short film starring Ted Danson and Emmy-considered for a comedic web series). I've been lucky enough to train with renowned acting teacher Warner Loughlin and am proud to be a lifetime member of the Actors Studio where I've learned from greats like Martin Landau, Lou Antonio and Lisa Richards. In junior high, I met my now husband and producing partner, Michael Steger. When we were 12 years old we didn't like each other very much. In our teens, we brushed by each other trading curious adolescent smirks, and in college we shared stories, hung out in bookstores and made fun of each other's crushes. After college, we fell in love and got married. My real life became a romantic comedy! Although there still weren't any heroines like me in my beloved "boy meets girl next door" films. In 2008, our small-town selves were blown away when Michael became the lead on 90210, a popular TV show. The experiences we had on that wild ride, and the insights I've had since then, as a black woman and an actress, inspired me to write "White Like Me." Our campaign goal is to raise money to turn my script into a finished film. We want to make a movie that has an African-American female lead but is not a "black movie" or a "white movie," but instead one that acknowledges women of color and the experience of trying to succeed in what often feels like a predominantly white, male industry. or if you value the fact that diversity makes everyone smarter, more creative and more innovative, we would be so excited and honored if you would contribute to our mission. We are grateful for your time and attention, and we hope you'll be there when we have the communal experience in a darkened theater watching the premiere of "White Like Me"! 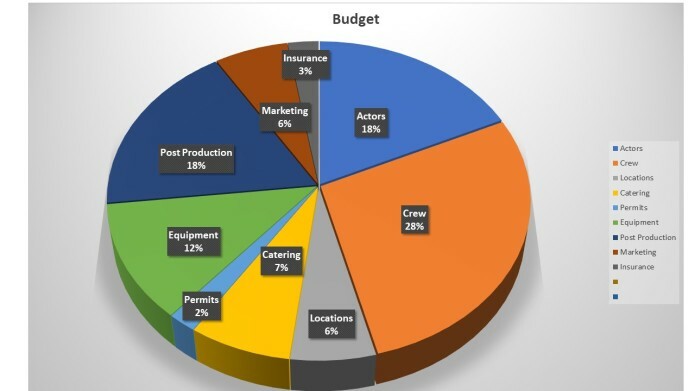 It can cost well over a million dollars to make even a small, independent film. Our goal was to raise the bare minimum--$250,000--for an ultra low budget production of "White Like Me," to be shot in 20 days. And, we're almost there! Please check out our perks and incentives! Any and all funds will go toward producing this original piece. Brandee Steger and Michael Steger are not new to producing. The first project they produced together was Brandee's one-woman show, Brandee Built on Crazee, which ran for eight weeks to sold-out audiences at the Stella Adler Theatre in Hollywood. Soon after this production, the Stegers started their production company, Book 11 Productions. 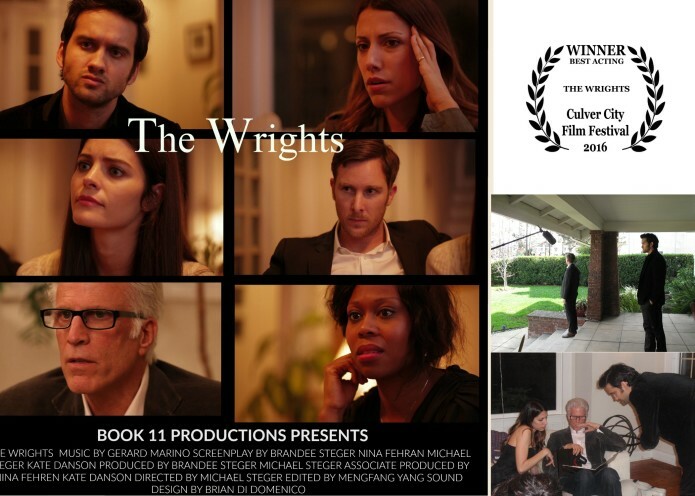 Through Book 11 Productions, Brandee and Michael co-produced The Wrights, an award-winning short film with Nina Fehren and Kate Danson and starring Ted Danson. This experimental film was mostly a dramatic improv, in which the scenes were partially written and the actors had to improvise their lines in only 2-3 takes. It was an edgy drama that centered around death, trust and family secrets. Shortly after The Wrights, Brandee and Michael produced an Emmy-considered comedic web series called, Not So Union. This series followed a group of friends who were brand-spankin' new to Hollywood and struggling with how to navigate their aspirations. Many comedians and seasoned actors jumped on board to help create this series described by viewers as "hysterical" and "offbeat." 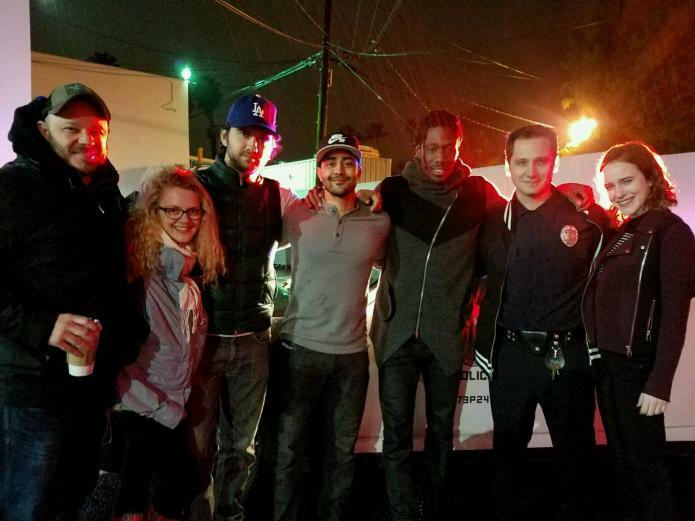 In 2018, Michael branched out to produce an independent short film called, Fifteen Years Later, starring Manish Dayal, Matt McGorry, Tracy Mulholland, and Golden Globe winner Rachel Brosnahan. Now, the Stegers are excited to take the next step and produce a full-length feature film, "White Like Me," under Book 11 Productions. And to our makeup artist (you know who you are!) - THANK YOU! It can be so scary to put yourself out there like this. But we recently decided we had a choice: we could sit around and wonder what it would be like to create our own full-length feature film, complain about the small percentage of black women in film, let time go by, wait for our next big breaks and hope for the best, OR we could get off our butts and make a feature film from our original perspective. Obviously, the risk is that nobody will give a damn, nobody will help, maybe the sky will fall in and our dreams will dissipate like the clouds. But now that we have a daughter, Poet, it has become clear just how important it is for her to see her parents strive to achieve their goals. So, here we are, as a team, holding up the sky with hard work, determination and faith. Repost/Share/Tweet our campaign on your social media! Tag your favorite celebrities on social media who care about a woman's perspective, female empowerment and African-American women in Hollywood. Tell your friends, family and acquaintances about our campaign. TALK, SHARE, REPOST, TAG, FORWARD and REPEAT! All donations welcome and will be so appreciated! THANK YOU! How much have you raised so far? Through crowdfunding and with the help of an incredible investor we are almost at our original goal of $250,000! Who is on your team? White Like Me will be Produced and co-directed by Brandee and Michael Steger with Executive Producer Antonio Enciso. We also have an amazing cinematographer and editor. How long will it take to get my reward? Most rewards will be delivered within 2 months. Some will take until the end of the year - depending on what reward you get. When do you start shooting? Our goal is to go into production in late Spring 2019. How long will it take to make the movie? We plan to shoot the film in 20 days and go into post production shortly after. What are your plans for the film? We plan to submit White Like Me to film festivals and eventually make it available on the major platforms. Personal message thanking you for your support. Hand-designed White Like Me tee shirt. A tag on social media thanking you for your support. 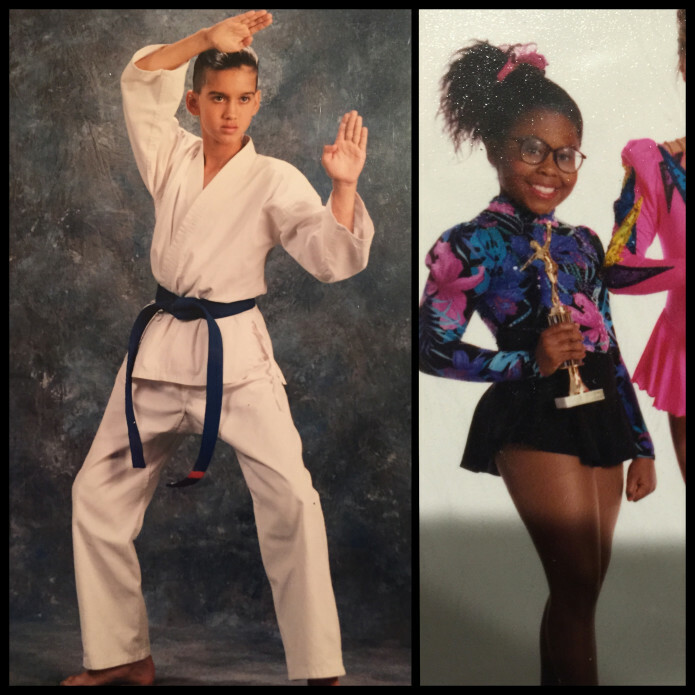 Growing up, Brandee trained professionally as a figure skater. She's pulling our her boots to show you some moves. So, grab your warmest gear cause you're hitting the ice with Brandee! One hour session in Los Angeles, CA. An intimate eight week acting session taught by Michael and Brandee Steger. Class will be held in Los Angeles, CA for 3 hours, once a week. October 2019 Includes how to get started, the business of acting and all things acting! Brandee and Michael Steger have been in a relationship for almost 17 years and married for almost 11. Through Skype, Facetime or whatever avenue fits you, they'll talk to you and your lover or just you intimately about love and relationships. (LOL) This is going to be a blast! We'll send you a personal video about how much your support means. Bring extra cash because we're going on a shopping trip to all the best vintage stores in Los Angeles. Brandee has a vintage collection in Los Feliz, CA and can show you all the best places to shop in the city. Brandee and Michael Steger will come to your event or party (within the U.S.) to talk about the entertainment industry and White Like Me. Or, to simply host your party! Come visit us on set! Brandee owns the vintage collection, Harlem RagShop 1934 in Los Feliz, CA 4519 Sunset Blvd. Los Angeles, CA 90068 and on Etsy! In this reward you'll receive one item worth $150 or less, shipped to you once a month for a year.